This timely book shows readers how to start their own ful-time or part-time home-based business using eBay. Selling on eBay is probably one of the easiest ways to start a new business, yet many people do not know how to go about it. This book will provide them with the basic knowledge to show them how to get started with a very small investment. It will show readers how to locate products to sell on eBay, conduct their own research, list their products and create great images. It shows how to get paid and how to deliver products. It covers profit margins and how much money readers can expect to make. Since running a business on eBay requires a knowledge of computers, there are chapters on how to select the right computer hardware, available options for connections to the Internet and there are reviews of some software packages which will help readers operate their own eBay business. It provides advice on the legal structure of a business and how to register for sales taxes. It covers some of the tax advantages of running a home-based business. Readers will find everything they need to know to start their own successful business using eBay and where to obtain further information. Chapter 1 - What Can You Sell on eBay? Chapter 5 - For What Price Do You Sell? 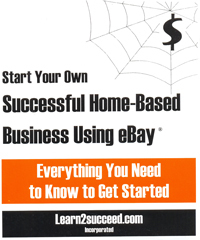 Start Your Own Successful Home-Based Business Using eBay™: Everything You Need to Know to Get Started by: Learn2succeed.com Incorporated: softcover; 226 pages; ISBN: 978-1-55270-250-5; published in 2007; $29.95.